After a couple of brutally cold days the temps today have finally warmed up to 20 degrees, which feels like a tropical heat wave! The sun shining through the windows was absolutely glorious, the kind that immediately puts a spring in your step! 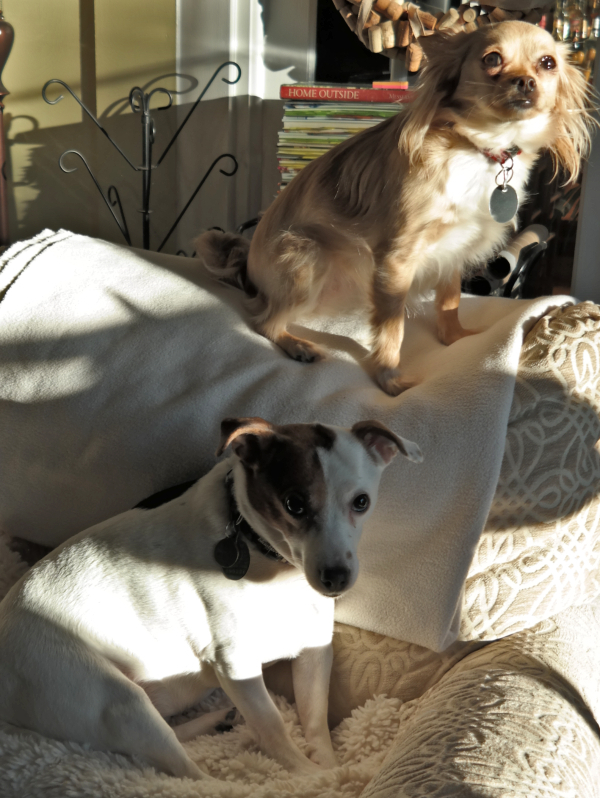 I wasn't the only one enjoying the sunshine this morning....Molly and the Monkey settled into their favorite chair in a little sun puddle, soaking it up. Look at these two little lovebugs...they are the best of friends, and usually when you find one you find the other. And to think I was worried about introducing a new pup into the house when I adopted sweet Molly! We often find Miss Molly perched on the back of Monkey's chair, up high where she can see out the window to the 'squirbles' outside at the feeders. What? That's what she calls them!! Molly's showing you her 'blinkety eye' face here....it's the face she gives us when she pretends she's not paying attention to what's going on around her, even though she is always on the alert for the sound of the treat-closet (aka my pantry) opening! Monkey's not one to be left out....here's her 'One Eyed Monkey' look....we get this look frequently, usually when we want her to do something she doesn't want to do....like eat her dinner. 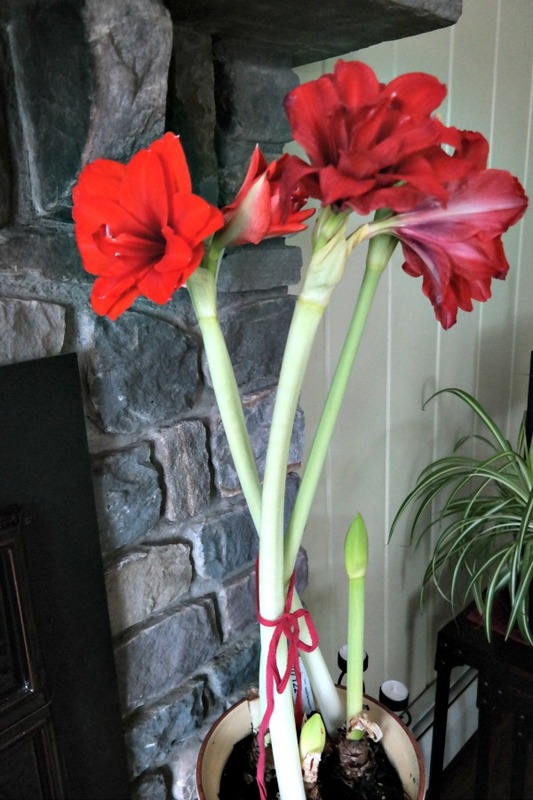 When I posted about my Mom's Amaryllis yesterday, I got questions about how to care for them. 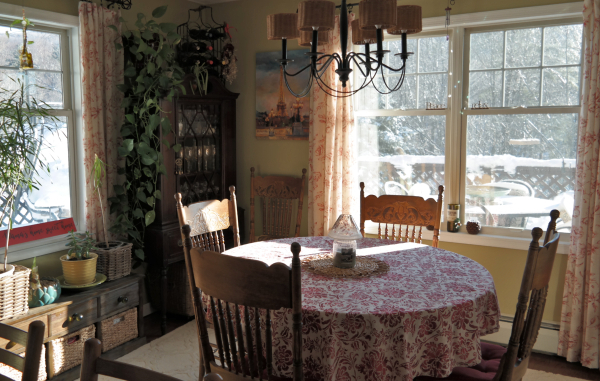 They are remarkably easy to force year after year, and bring such beauty and light into our winter homes. And this photo was taken this morning. I'll feed it when I feed the rest of my houseplants, with this awesome liquid plant food. I can't wait to see those gorgeous flowers brightening up my dining room! 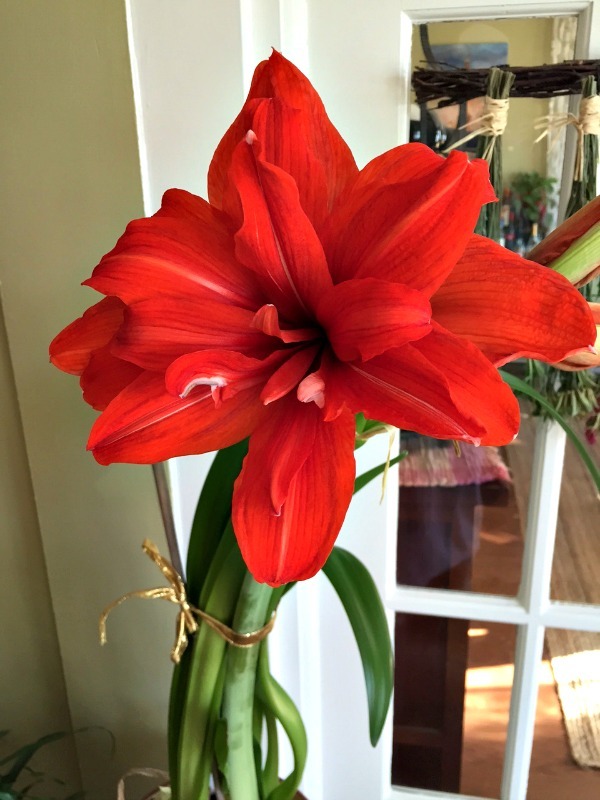 I posted about Amaryllis care back in January of 2016 - I'm re-posting here for all of my new readers, and anyone who needs a refresh on Amaryllis care. Unfortunately, the bulbs I bought in 2014 died in an early cold spell when I had them sitting in my garden cottage one busy autumn, waiting for me to re-pot them. So sad, and I won't let that happen again! 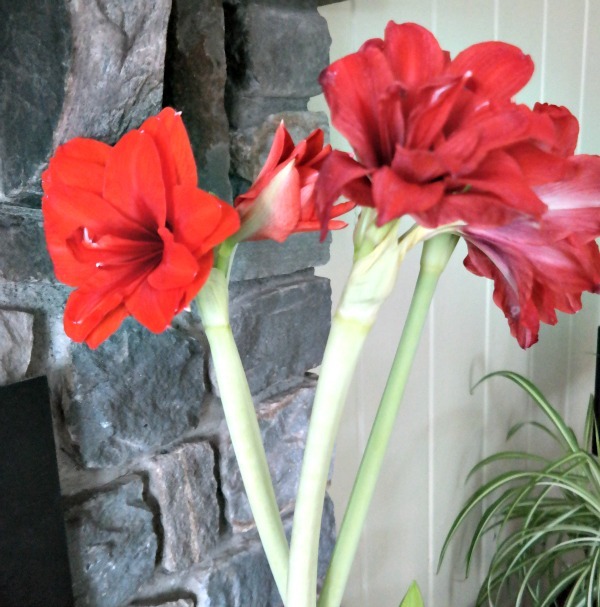 Note to self: buy more Amaryllis bulbs!! Here's the original post - enjoy! They each have their own personality, no doubt, Lisa!! Molly is sweet and subservient, Monkey is the ringleader, the alpha dog. My old girl Lily is deaf and mostly blind at this point, but she was always the best girl, so well behaved and incredibly sweet. 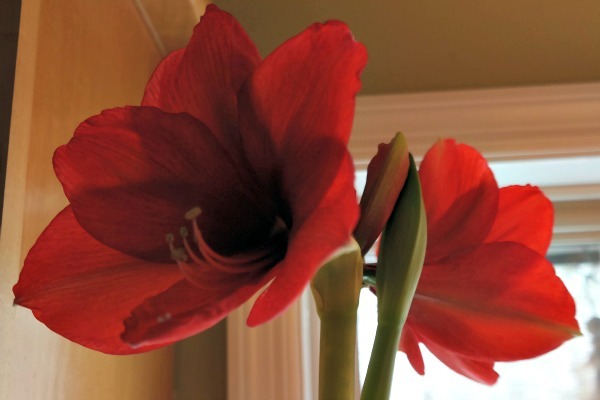 We've had our amaryllis for probably 5 years now, and have had beautiful blooms every year with very little work. 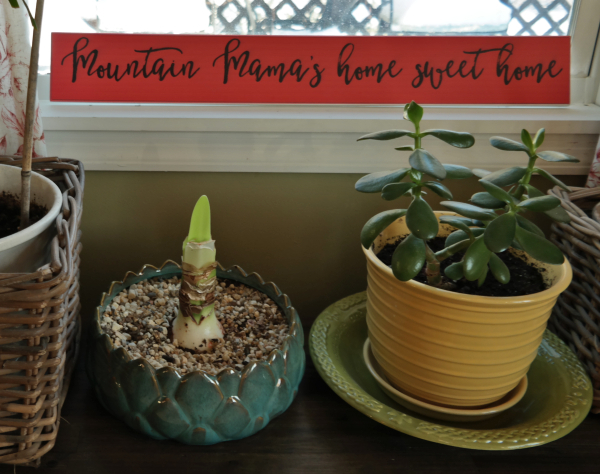 One plant I have tried to grow over and over with no luck is a jade plant - yours looks nice and healthy! My grandmother used to have a very old and huge jade which my Mom inherited and kept healthy for many years. She gave it to me and within a few years it was gone. Have tried several times since with no luck - the poor things! Do you have any tricks for growing them? That's funny, Sue, this is the first Jade I've had that's happy!! 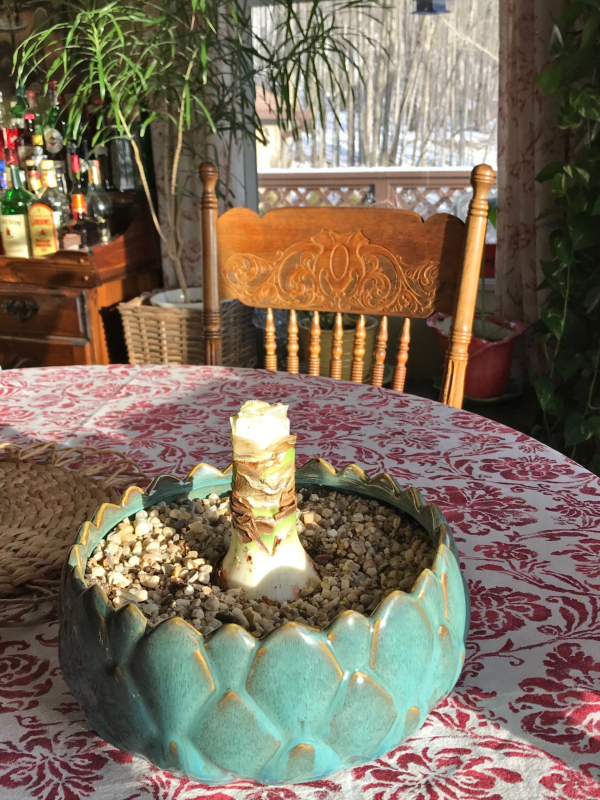 When I bought the house, the previous homeowner had a beautiful huge old jade that she took with her, but she gave me pieces she had rooted as a housewarming gift. I planted them the same way I would any other plant....and they died. I tried rooting a few pieces of it before the whole thing died, and they died too. Then I bought this one at the farmer's market for a whole dollar (not in this pot, of course) and it's happy!! The trick is not to water it much - I water it very lightly once a month, that's it. Try it again, see if that works!! It's warm and sunny here today, too...a high of 28 and like you said, it felt absolutely tropical!! We're going up to 48 tomorrow, Kim, can you believe it? I hope some of the snow and ice melts so it's not so dangerous walking and driving around! Thanks for the tips! To think I thought they were throw aways! Glad to help, Karen Ann!! Hope you have one you can save this year? I love how you embrace winter's full force, Debbie (your last post), and those love bugs are SO adorable! They are my sweet babies, Rita, I adore them even though they wake me up too early!! Thank you so much for these instructions. 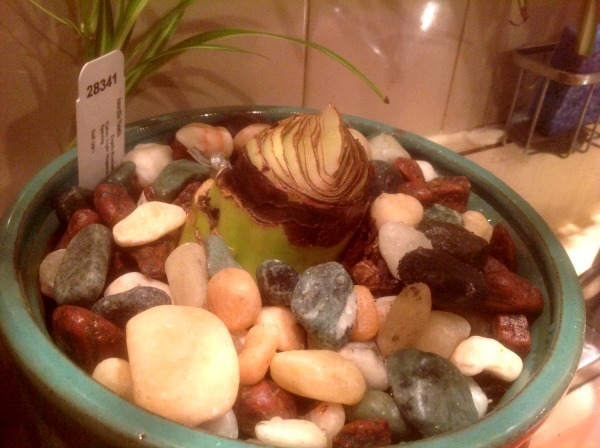 I’ve never kept a bulb to rebloom before. Now I will!!!! Absolutely, I'm so glad I could help!! 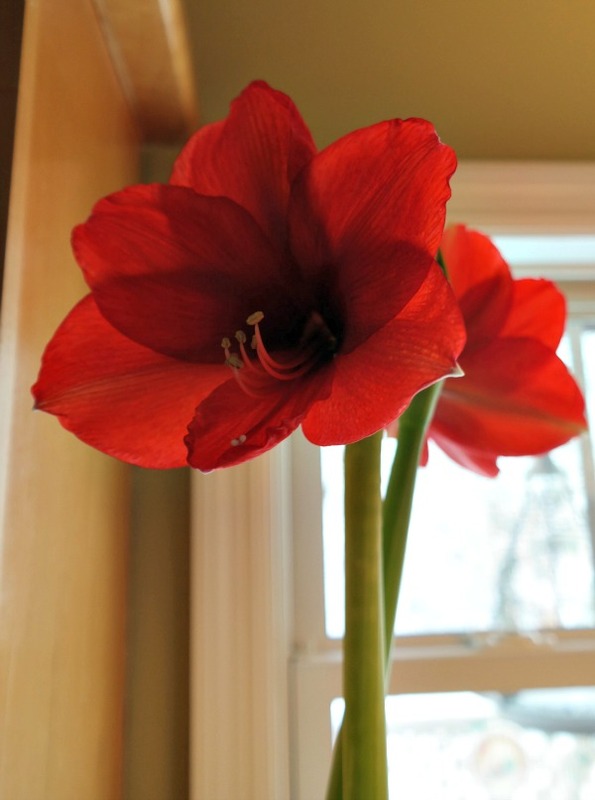 My red amaryllis re-bloomed for five years. It didn't bloom last year, but I have hopes for it this year. My while with pink one called Apple Blossom is putting up a flower spike now. Maybe it just needs to be re-potted, Carole? I just looked up the Apple Blossom one, it's gorgeous! I honestly can't remember what color I got for my mom, I'll find out when it blooms I guess! Those flowers are gorgeous!! And such a beautiful reminder of spring/summer and the red is so vibrant!! 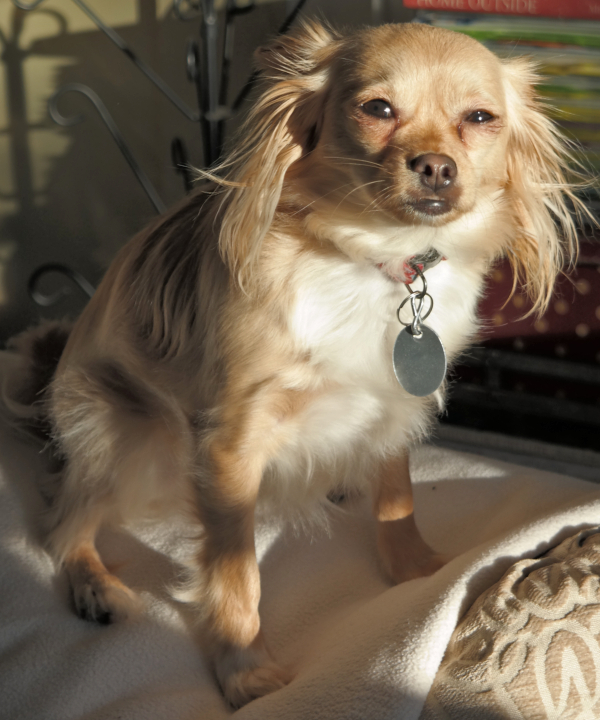 The fur-babies are adorable and I love how you portray their personalities! You are so precious and funny! Love and hugs!! 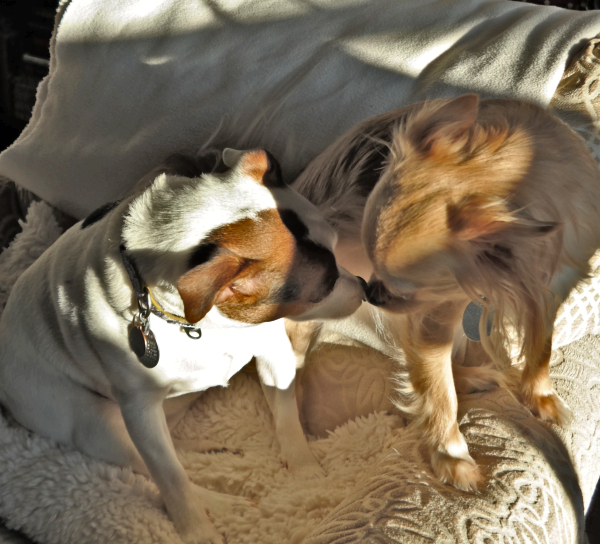 My fur-babies are precious and funny, Benita - they make us laugh every single day!! Wow, that's awful, Melanie - that's the weather we had Monday, it was absolutely brutal! Well you know I can't pass up a red flower! Your furbabies are so adorable. And best friends! They are so cute, Brenda, and I'm so glad they get along so well! So pretty and the pups are too cute. It's amazing how they each have their own personality. Happy you got some sun. I had to laugh when you said heatwave. The same thing went through my mind when you mentioned 20 degrees. My weather app says now that tomorrow we will be up to 49 degrees, Cindy - what the heck? The following night it drops down to 3. Bizarre weather! Molly and Monkey are so adorable. It has been so bad here in Illinois and we are dropping even lower after freezing rain and snow yesterday. Old Man Winter is here to stay for us now. 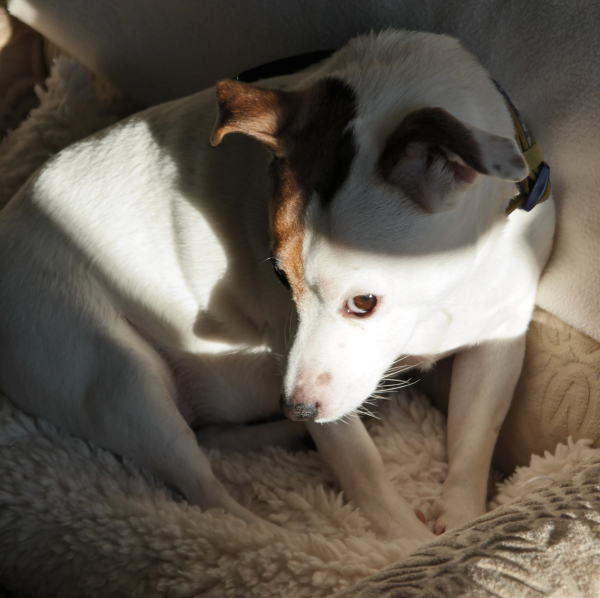 Buddy loves to find that spot when the sun does come out to lay. He is laying right now in front of the heat vent. Have a great rest of the week. Buddy's smart, Kris!! Molly conks out in front of the wood stove sometimes, right on the hearth rug - she's such a tiny little thing, I'm sure the cold goes right through her! I let my red amaryllis stay out too late this fall too, Debbie. So decided to go with amaryllis Caprice, a pretty pink and white one. 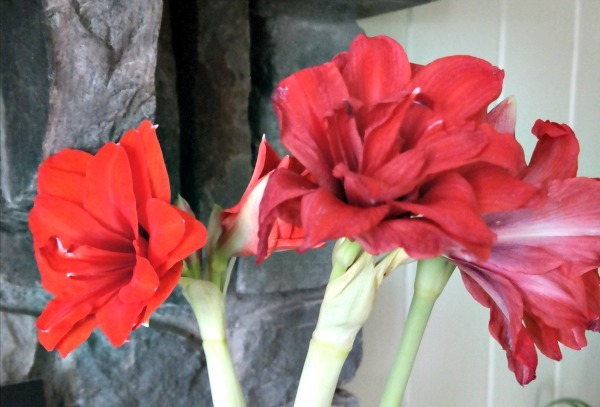 At one time at the old house I had six or seven years of amaryllis plants reblooming every year. But we don't have a cool dark closet here to use for their dormancy period. I'll do my best with this one next fall, crowding it in next to the dark water heater closet and hope for the best. You catch the cutest shots of your beautiful fur babies! They show such personality! Oooh I looked that amaryllis up, Dewena, it's lovely!!! I'm so annoyed I didn't get mine inside early enough that year, I lost 3 bulbs I think, grrrrrr! Aren't they the best, Nancy? I can't imagine my home without a furbaby or two!